Art on the Underground works with artists to change the way people experience our city. 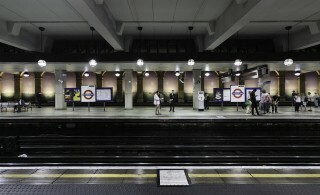 We invite artists to create works of art for London’s Underground that are seen by millions of people each day. Incorporating a range of artistic media from painting, installation, sculpture, digital and performance, to prints and custom Tube map covers, we produce critically acclaimed projects that are accessible to all and which draw together London’s diverse communities. We further London Underground’s longstanding history of working with leading artists from Henry Moore to Eduardo Paolozzi. 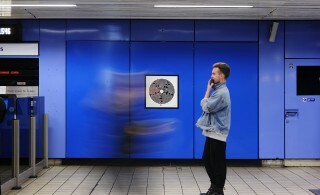 Since our inception, we have presented acclaimed projects by UK-based and international artists including Turner prize winners, allowing Art on the Underground to remain at the forefront of contemporary debate on how art can shape public space. ‘What is the city but the people?’ by conceptual artist Jeremy Deller, in which a passport-sized booklet was given to operational staff on the Piccadilly line, with drivers and platform staff encouraged to use the quotes in their daily communications with customers. ‘Peace and Love’, a panorama of abstract motifs from internationally renowned artist Beatriz Milhazes in the Victorian arches of Gloucester Road station. 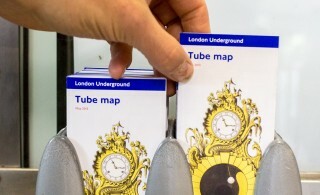 Tube map covers by major British and International artists including Rachel Whiteread and Yayoi Kusama, with emerging artists including Samara Scott creating covers for the Night Tube map. ‘Labyrinth’ by Turner Prize winning artist Mark Wallinger, in which permanent artworks were created for each of London Underground’s 270 stations. 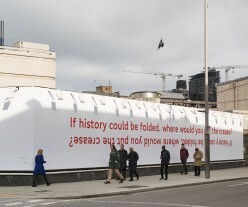 #LondonIsOpen campaign in response to the EU referendum in 2016, involving ten artists including Tania Bruguera and Hew Locke, creating artwork for sites across the Tube network. 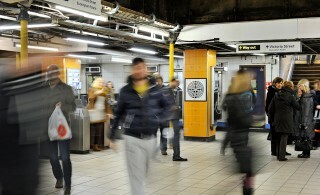 Art on the Underground is funded by Transport for London, with additional financial support for some commissions from bodies including Arts Council England. Corporate sponsorship also forms part of the funding for specific projects.